A bevy of brewers brings delicious ales, porters, stouts and more to the center of Wisconsin. Here’s a closer look at the craft breweries in the Stevens Point area. Central Waters Brewing Company. This eco-friendly brewery, located in Amherst, focuses on sustainability, with solar and photovoltaic arrays that provide heat and energy, as well as a tasting room bar built from recycled materials. O’So Brewing Company. This Plover brewery celebrated its fifth anniversary in 2012 and boasts a tasting room that features 40 Wisconsin beers on tap, including several nitrogen taps. Kozy Yak Brewery. A newcomer to the craft beer scene in the Stevens Point area, Kozy Yak in Rosholt also produces an array of wines to please the palate. 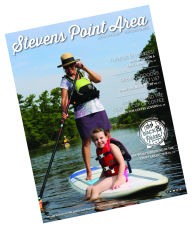 Stevens Point Brewery. Sitting on the same land on which it was founded in 1857, the Stevens Point Brewery is undergoing an expansion that will allow it to produce 150,000 barrels a year.